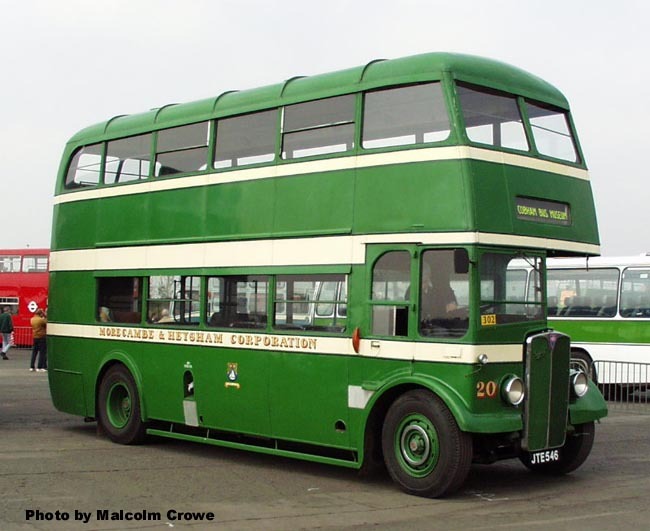 The AEC Regent commenced production in 1929 along with the Regal single-decker. 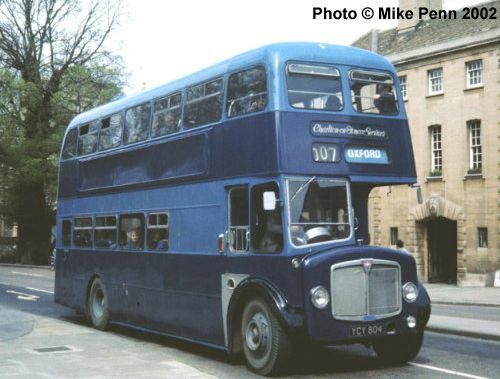 Regents in various forms remained in production until 1968 when AEC ceased production of double-deckers, having no rear-engined model to offer the market. 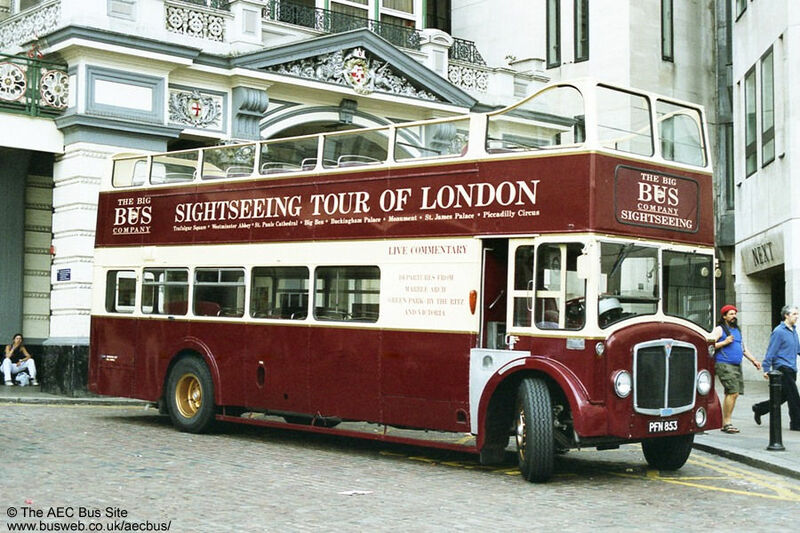 The early Regents were successful both in and outside London, but it is the later longer wheelbase models which are best known, especially the London STL and RT classes. There are many examples of the Regent III based RTs in preservation today. 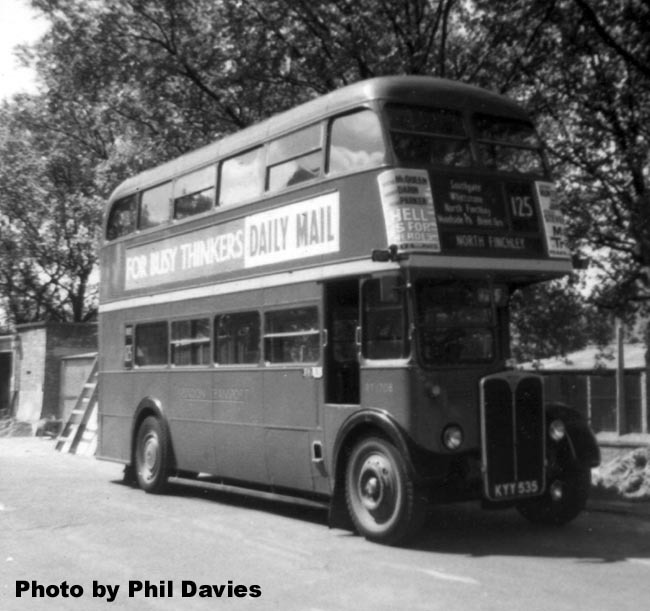 Here's a classic picture of London Transport AEC Regent III RT1708 in service in 1960. One wonders which newspaper was bought by busy people who didn't think. Photo by Phil Davies. Former London Transport RT class Regent IIIs were be found running the summer open-top service on the channel island of Guernsey up to 2000. Number 14, originally RT2494 (KXW 123), was seen at work in the 1994 season. 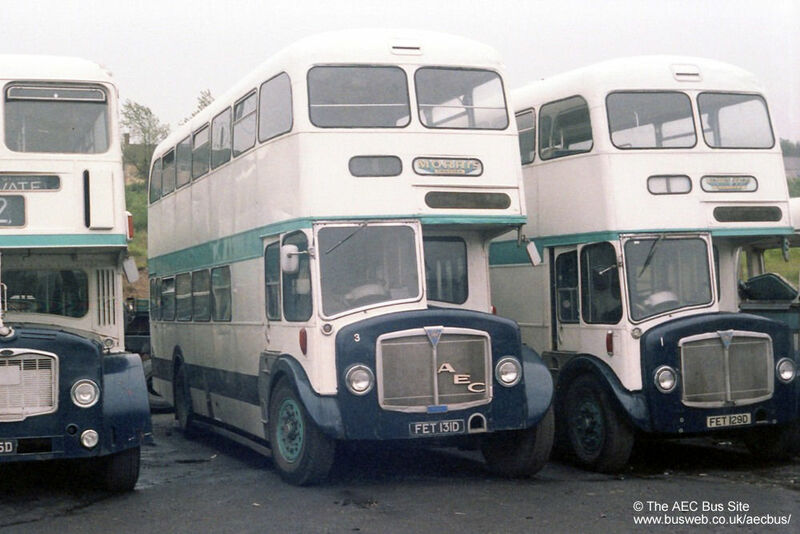 With the demise of Guernseybus, the three open-top Regents plus an unused closed top model and a brace of open-top Leyland PS1 Tigers all went to dealer Nash of Weybridge for preservation or resale. RT2494 is now privately preserved in Guernseybus livery. 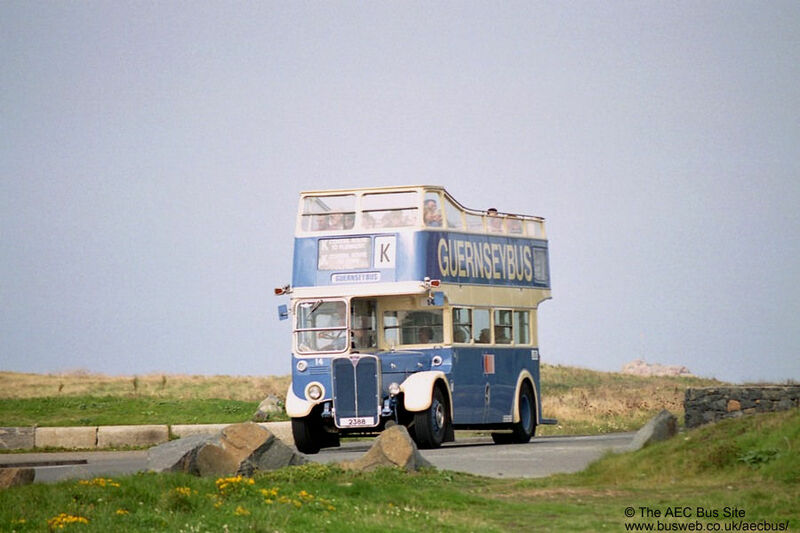 Another of the Guernseybus trio of open-top Regents passed to Blue Triangle and subsequently to the London Bus Company heritage operation when Blue Triangle was sold to Go-ahead. It was seen near Great Dunmow in 2006 on a Blue Triangle summer Sunday operation. Green London Transport Regent III RT3775 spent some time as a member of the London & Country (the renamed London Country South West) heritage fleet. It was seen on a "Santa special" duplicate working at Walton on the Hill in December 1994. 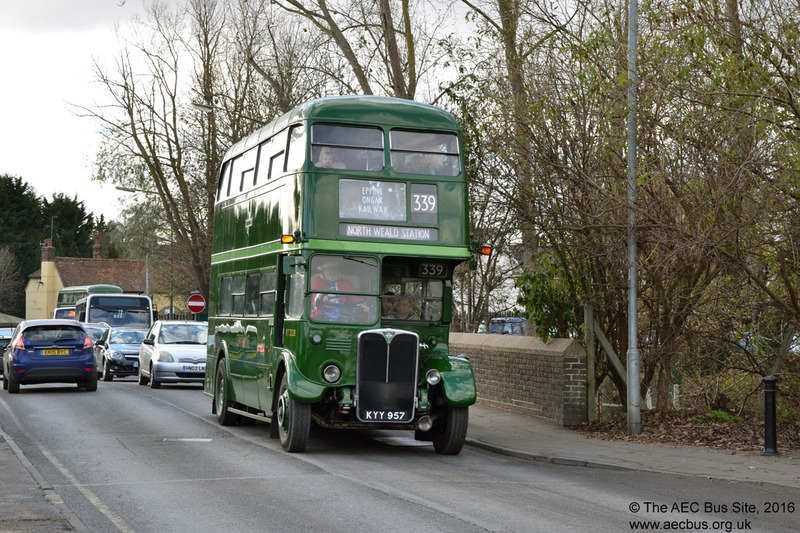 The bus was later sold and is now in private preservation following a spell in the Ensignbus heritage fleet. Ensignbus green RT1499 is another fully licensed for public service. The London low-emission regulations limit use in the central area, so they are usually confined to special services in the surrounding area. RT1499 was seen at Epping on an RT running day in April 2009. 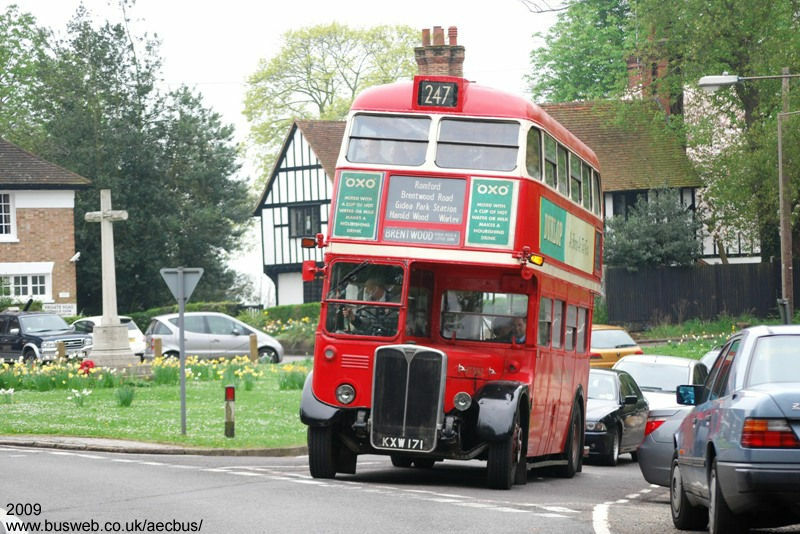 The oldest operational RT in the Ensignbus fleet is 1939 built RT8, seen at Brentwood in August 2011 on one of the company's heritage running days. These events still take place on the first Saturday of December each year. Ex London Transport Regent III RT3062 can still be found on the road, as it is fully PSV licensed with Roger Wright's London Bus Company. Along with other RTs in the fleet, it is generally confined to special duties and running days, such as when pictured at Warley village on an RT running day in April 2009. KYY 957 London Bus Company vehicles are often found on services running in association with the Epping Ongar Railway. Ex London Transport Regent III RT3228 was seen employed on such work at Ongar in December 2016, with Santa claus at the wheel! 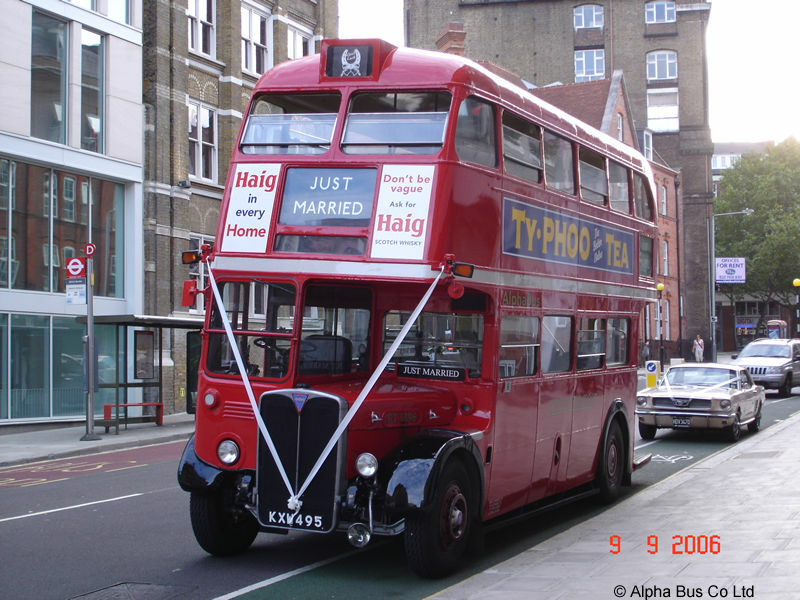 A popular and increasing use for classic AEC Regents and Routemasters is for wedding hires. 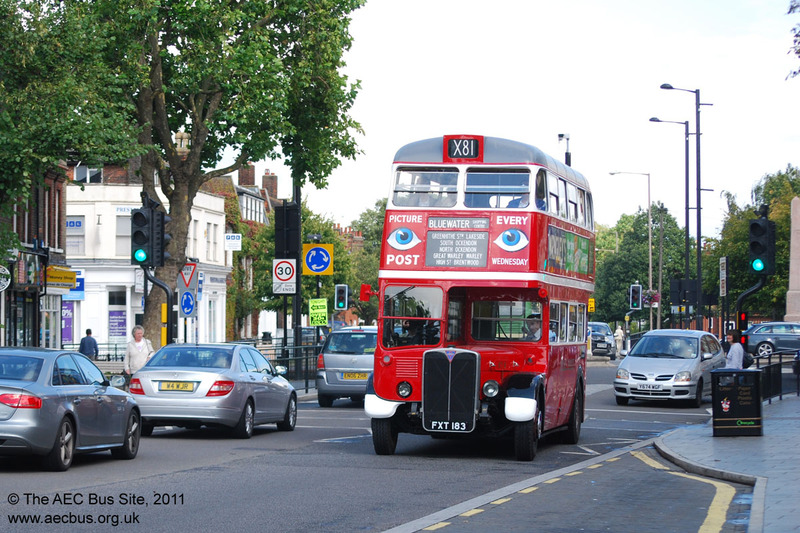 Ex London Transport RT1396, owned by AlphaBus, was seen in this role at Putney in September 2006. Photo by Mike Tamkin. An ex London RT on public service in deepest Dorset in 2011. Shaftesbury & District were helping Verwoodbus by providing a vehicle for their Friday service from West Moors to Poole. 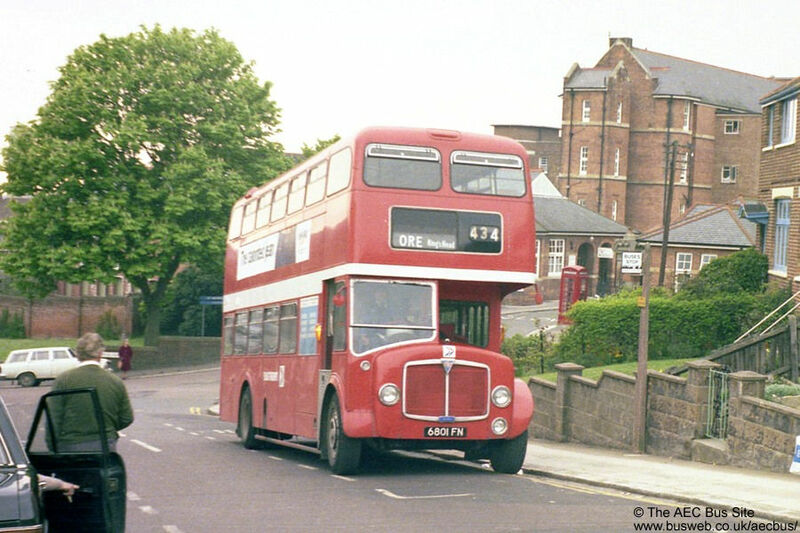 Usually a forward entrance Routemaster was used but on 11th April it was needed elsewhere so RT4777 got the job instead. It was pictured at Bournemouth, with RF421 in attendance as a duplicate. The service was withdrawn later in the year following loss of the associated school contract. Photo by Peter Legg. An RT on a Central London scheduled passenger bus service in 2014. As correspondent Eric Price put it: "Who says tube strikes aren’t useful?" It was running service extras on the Victoria to Hackney 38 service. Photo by Eric Price. 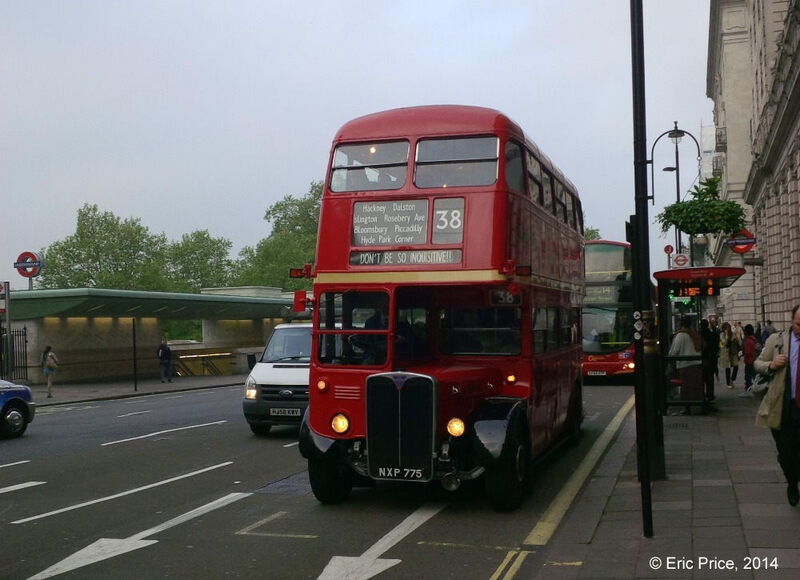 Here is 1947 built AEC Regent III RT3062, still in revenue earning service and pictured doing what it was built to do 71 years earlier - taking Londoners back to their homes in the suburbs. 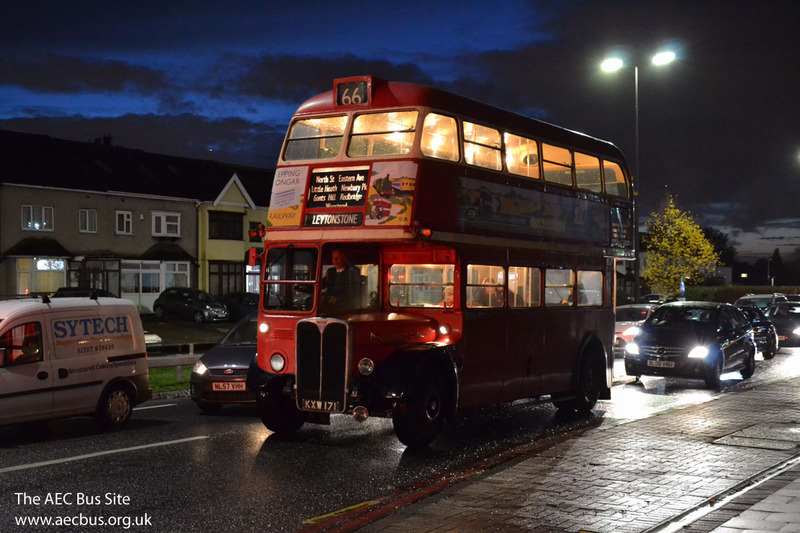 The occasion is the Central Line tube strike of 7th November 2018, when heritage operator London Bus Company was contracted to provide service extras on a number of routes including the 66 between Leytonstone and Newbury Park. Already blinded up for its return journey, it is seen inching towards Newbury Park station in heavy traffic. 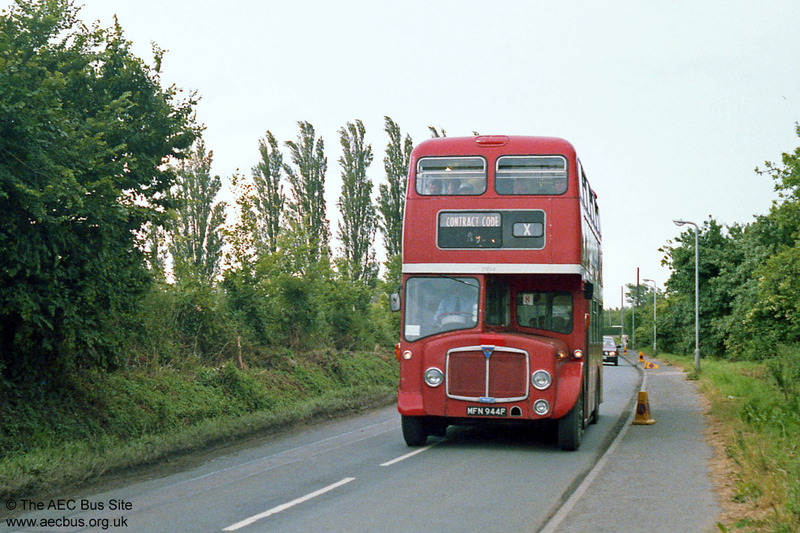 East Kent ran a large fleet of Regent Vs with Park Royal front entrance bodywork, and some of these were even converted for one person operation in the mid 1970s. After becoming redundant at Canterbury following OPO conversions, 7801 was seen while on loan to sister company Maidstone & District in May 1978 to assess the feasibility of running these vehicles on crew operated services in the Hastings area. 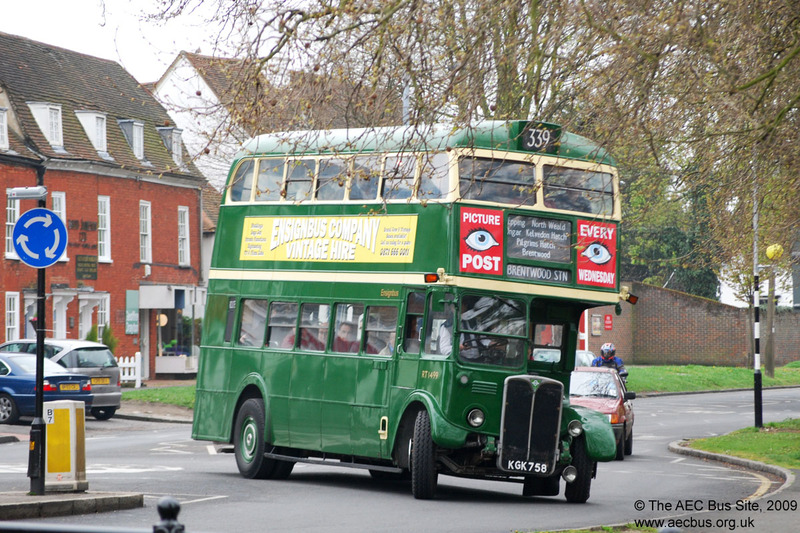 This bus in now preserved by a member of the Friends of the East Kent (FoTEK). The first batch of East Kent Regent Vs had unusual full-front bodywork. Four of these outlived the rest of the batch by being converted to open-top for the Isle of Thanet service. 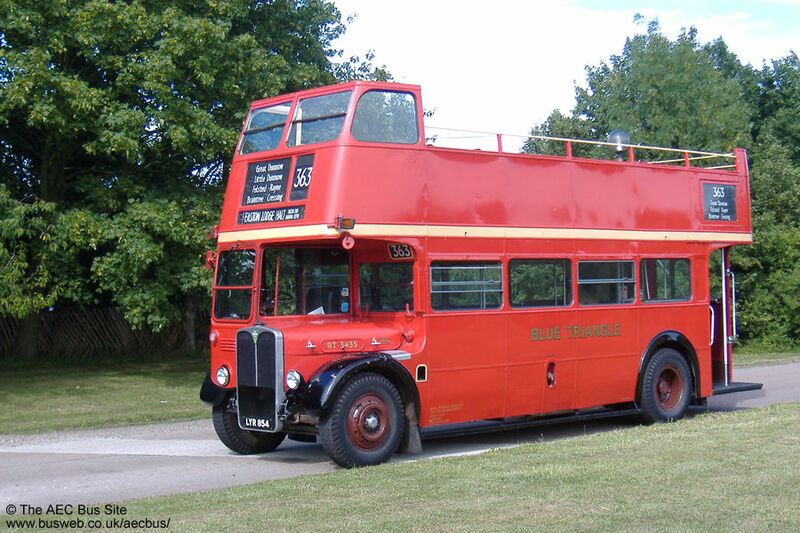 After a spell in preservation, PFN 853 passed to London sightseeing firm the Big Bus Company. It was seen at Charing Cross station in August 2004. It subsequently passed back into preservation ownership in 2006. Some of the last Regents went to East Kent (although Douglas Corporation got the last). Some were retained for contract use after being withdrawn from normal service in 1982, and 7944. one of the last batch, was seen on a shuttle service for the Open Golf tournament at Sandwich in July 1985. It was withdrawn later the same year. East Kent 7946 was withdrawn from service early and spent many years as a ticket office at Hastings for Maidstone & District and Hastings & District. 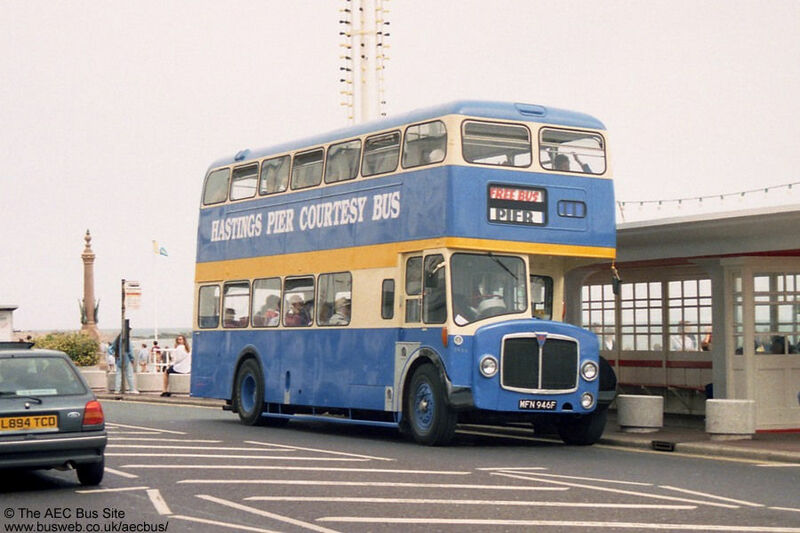 It was then returned to service, passing via Hastings Buses to South Coast Buses, where it saw sporadic use on contracts and reliefs right into 1999. Here it is on a Hastings Pier service in the summer of 1994, still in H&D livery. 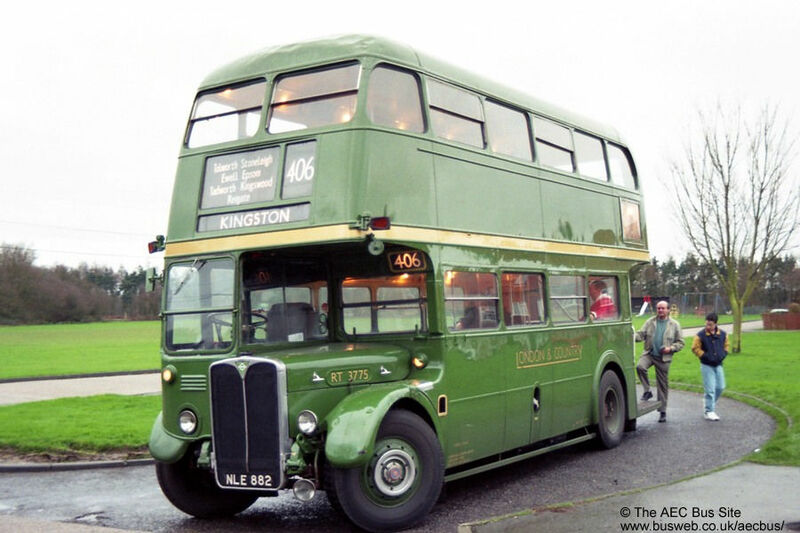 This bus was later transferred within Stagecoach back to East Kent as a special events vehicle, repainted in traditional livery, and appears regularly at rallies in the area. Further pictures are on the Before and After page. Additional info from Paul Houselander and M&D and East Kent Bus Club. 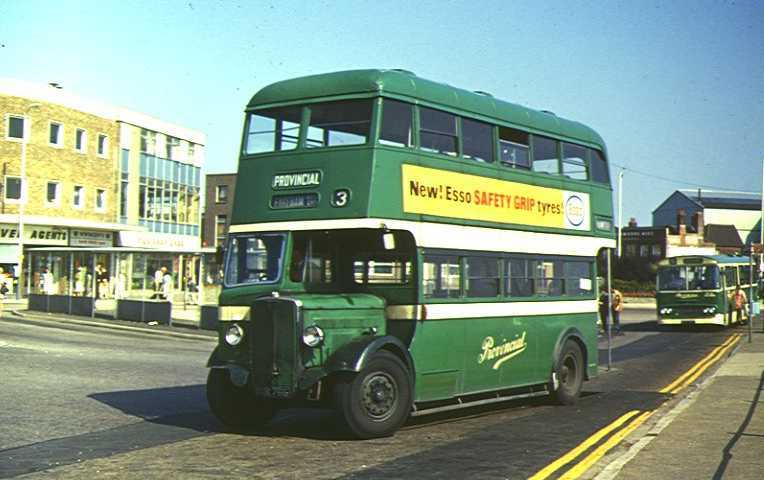 Morris Brothers of Swansea, once a large operator of contract services in the area, had this pair of Neepsend bodied AEC Regent Vs in their fleet. They were new to Rotherham Corporation, later passing to South Yorkshire PTE before being sold initially to an operator in Scotland before passing to the South Wales operator. They were pictured at the company's depot in June 1983.